Laminated Safety Glass can be used on Shop fronts, windows, doors, shops, Offices, Factories, Shelves, Schools and is a requirement in many area's. Multiple laminates and thicker glass increases the strength. 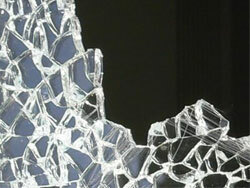 Bulletproof glass is often made of several float glass, toughened glass and Perspex panels, and can be as thick as 100 mm. A similar glass is often used in airliners on the front windows, often three sheets of 6 mm toughened glass with thick PVB between them. Newer developments have increased the thermoplastic family for the lamination of glass. Beside PVB, important thermoplastic glass lamination materials today are EVA (EthylVinylAcetate) and TPU (thermoplastic Polyurethane). The adhesion of PVB/TPU and EVA is not only high to glass but also to Polyester (PET) Interlayer. Since 2004 metallised and electroconductive PET-Interlayers are used as substrate for light emitting diodes and laminated to or between glass.